The Zoomstart Whatsis category is the place I post about cool stuff. A paraglider is basically a plane in a bag. What’s cooler then that. If you’re lucky, there’s a place to go paragliding near where you live. 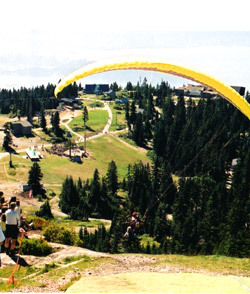 Here in Vancouver, you can go up to Grouse Mountain during the summer and experience the best ride in town thanks to the great people at First Flight Paragliding. I took a buddy up with me just to do something crazy because it was his birthday. The experience was awesome. I think everybody should do it at least once. Before you go, you get some basic orientation and training. Once you get up to the ridge above the Peak Chalet, it’s time to get your helmet on, your harness, and set up the glider. Just like tandem skydiving, you’re strapped to the glider with the instructor. Then you just wait for the right wind to come along. Once it does, your instructor lifts the glider up and shouts “Run!”. On Grouse, you’ll get about 15 to 20 feet down the ridge before the glider picks you up and you swoop down over the Chalet. My take-off went something like this: “Run! … Stop! … Run!”. We got a gust of wind from the side when we first tried to take off which pushed the glider sideways. Kerry, who was my instructor, managed to get it back on track and we were off. He said that our take off was a 7 out of 10 in terms of difficulty which doesn’t happen often. As soon as you pass over the Chalet area, you leave the top of the mountain on the West side. Suddenly there’s 2500 feet of nothing below you. The ride lasts about 15 to 20 minutes. You weave around in figure eights looking for thermals that rise along the side of the mountain. Thermals are like elevators. When you catch one, the glider goes straight up. Of course, if you hit a pocket of cold air, the elevator goes down. If the instructor has a good amount of confidence in you, he’ll let you pilot the paraglider for a while. I got to fly it for about 5 minutes and that definately made the experience better. They land down in a park at the foot of Grouse Mountain. And then you want to go again. No one can hear you scream. The one thing you notice is how quiet it is up there. Just the gentle rush of the wind is all you can hear. It’s relatively safe. Unlike parachuting, the glider is already open when you leave the ground. The instructors are very well trained; as part of their certification program, they actually have to collapse their glider mid-flight on purpose and then recover from the collapse. Did I mention … it’s the best ride in town. If you’re thinking about doing something different and edgy this summer think about going paragliding. If you have to work up the courage, start working on that part now. Make it a goal. Who knows, you might like it so much you go out and buy yourself a plane in a bag. Looks like lots of fun ! I’ve always wanted to try this, but haven’t had the opportunity yet. It’s a lot of fun. Like I said, Summer’s coming – make it a goal!